Not a strapless dress girl but definitely want to be a princess on your big day? 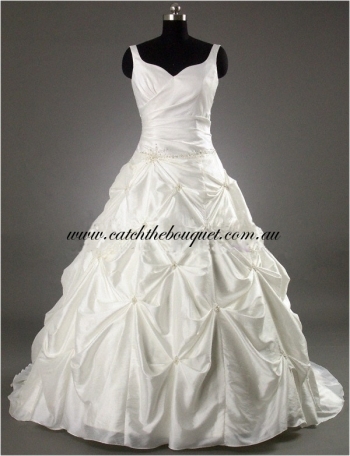 Or simply don't think you'll feel comfortable in a strapless bra on such a big day? You're not alone! Christina is a dream dress for anyone who is lusting after the perfect princess dress but ISN'T taken with the sea of strapless styles. Still absolutely feminine and delicate, but strong enough to easily conceal a bra-strap, the straps on the 'Chrstina' in combination with her exaggerated sweet-heart neckline make her absolutely stunning. 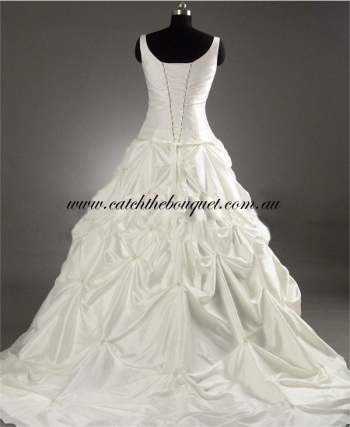 And how could we not mention the gorgeous taffeta ballgown with pick-ups and cathedral length train? All elegantly dotted with beading to complete your perfect princess apparel! 'Christina' will be custom made to your measurements and lends itself to flattering everyone from the tiny to the fuller figured woman!To achieve the fullness shown in the photos, we recommend wearing a petticoat/crinoline under this dress. While not included, we do have a new range available at the best prices anywhere! Check the Petticoat/Crinoline section for more! 5). She's in your arms. 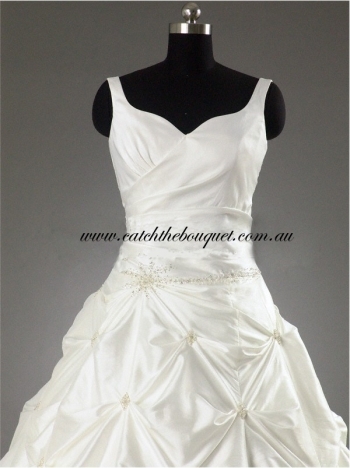 You're very own custom-made dream dress at just a fraction of the price of bridal salons and department stores.